Thank you for making our wedding day so special. From our first conversation, when you were making muffins for your children we knew you were going to add the personal touches to our wedding. A personal touch with complete professionalism. Organising a wedding from a different town can have its challenges, however your local knowledge assisted in so many ways. Make-up, hairdresser, decorator etc etc. Although your actual job was to be our celebrant you helped us in so many ways to make our day run so smoothly and assisted in so many ways to make our wedding day perfect. Thank you so much for doing such a great job at our wedding. You made it very personal and touching. We got asked so many times if you were a family friend from our guests because you made it so thoughtful and just the way we wanted. Both mike and I enjoyed every minute of our day. Thanks for making it so special. Cindy Pocock was more than our celebrant on our wedding day, her preparation for our day was beyond our expectations. Cindy took the time to get to know us personally and offered advice and information that suited our personalities. Sonny and I highly recommend Cindy as your celebrant, her professionalism, knowledge and friendliness made our ceremony unique and personal. It was fantastic to have you conduct our ceremony. We had such a good time on the day, it was all so relaxed and the weather smiled on us! A lot of people commented on how lovely the ceremony was, so thank you ever so much.I will send you some photographs when I receive them! Take care Cindy, all the best. We couldn’t of wanted anything more for our special day. Thank you so very much for the wonderful job you did on our day and tolerating the miserable weather which was set upon us. You did a marvellous job and everything ran so smoothly (even if i did forget where i was for a moment!!!!!!) and this would not have been possible without your guidance and effort. We had a wonderful reception and could not have asked for anything more out of our day (perhaps a little sunshine, but we won’t hold that against the weather man!!). Again thank you very much and all the best for the future. Thank you so so much for making it such a beautiful but casual ceremony – it fitted us so well. I was actually so nervous about the actual ceremony and just really keen to get it over with to get to the reception but in actual fact the ceremony turned out to be my favourite part! It was such a perfect day, I could not of asked for anything more! I also did not expect to find it so emotional, but it is a moment in my life I will never forget and I am so glad now we didn’t just go to a registry office. You were right too about James messing up his vows! I will email you some pics once our computer working again. Thanks again Cindy, it was such a pleasure to have you as our celebrant. Talk soon. Graeme & I are from Perth but we eloped & got married in Coffs Harbour. It was so magical & we were lucky to have Cindy as our celebrant. She was warm & kind & we felt really comfortable with her. Thanks Cindy for making it such a special & memorable day. Hi Cindy I still can’t believe that we got married on the beach we were truly blessed that day someone was really looking out for us!! Thank you for being our celebrant I wouldn’t of picked anyone as lovely as you it was so nice to have you apart of our day!! We were so happy with our wedding day it was perfect it was worth every cent or thousands I should say and every tear that I shed for the three days previous!! Sorry we laughed a lot and probably acted silly, we were pretty nervous 🙂 this why I forgot my lines 😉 you were perfect for our day, you did well!!! Thank you for everything. You were truly amazing and we are so pleased we chose you to be our celebrant. As you know, I was so nervous but with your guidance and calmness I managed to get through it fairly incident free. We couldn’t have faulted one thing about our entire wedding and week at the Villa. Everyone was blown away and were already planning a return to the villa next year for our anniversary. I wanted to let you know how much we appreciated having you as our celebrant… I cannot speak highly enough of you even though our meeting was so brief. You took on our personalities and truly it felt like we had known you for ever. As these days are so special a good celebrant is needed. Again we cannot thank you enough, you were part of making our day very special. Hi Cindy, thank you very much for a beautiful ceremony. Everyone commented on what a lovely person you are (how true!!) It was the perfect day enjoyed late into the night by all. Thank you so much for making our day perfect. 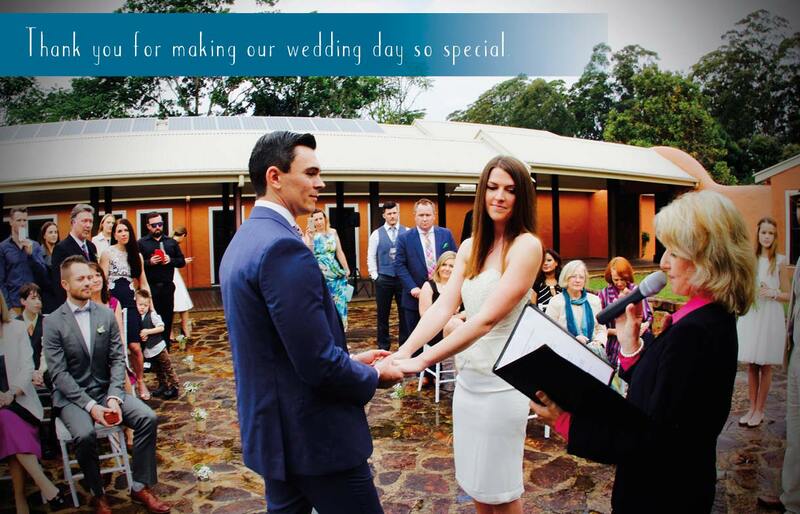 Everyone commented on how fantastic our celebrant was and said that you did a great job. Kind regards Kim and Arvinder. Thanks a million for the most amazing day of our life….you were so perfect for our wedding day. You were there for us every step of the way and helped make our wedding everything we wanted. Our family and friends had so many lovely things to say about you. I love that you were always there for me to chat to when I needed. We just got back from our wonderful honeymoon in New Zealand, we had the best time. Thank you for everything and making our wedding day special. You had great ideas which made our day perfect, we felt so comfortable with you. When I called to chat with you, you made things so easy from our first conversation I highly recommend you to any future couples. We would like to thank you for all your help, not only with the ceremony but also calming our nerves. You were able to make the ceremony as relaxed and enjoyable as we had hoped for. A number of our guests have commented on how well you were able to showcase our personalities in such a lovely ceremony. Thank you for the advice to breathe and take in the whole day, we had a fantastic day. Cindy made us feel completely relaxed and at ease from the rehearsal to the ceremony, she was very flexible with the order of our ceremony and provided plenty of advice and guidance. Cindy was so natural and let us involve our family members in the wedding, Cindy truly contributed in making our wedding day the most amazing and memorable day of our lives and we will never forget how she made time for meetings, rehearsals and helped calm our nerves and got us down the aisle. Our day was absolutely perfect.